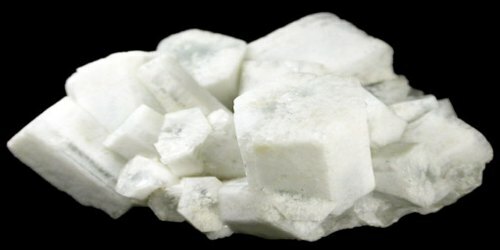 Strontianite (SrCO3) is a white, lightly coloured, or colourless mineral consisting of strontium carbonate in orthorhombic crystalline form: it is a source of strontium compounds. t is a rare carbonate mineral and one of only a few strontium minerals. It is a member of the aragonite group. The ideal formula of strontianite is SrCO3, with molar mass 147.63 g, but calcium (Ca) can substitute for up to 27% of the strontium (Sr) cations, and barium (Ba) up to 3.3%. Strontianite was named in 1791 after its initial discovery in Strontian, Argyllshire, Scotland. The element strontium, which was undescribed prior to this occurrence, was subsequently named after this mineral and its locality. The principal strontium ores are celestine SrSO4 and strontianite SrCO3. The main commercial process for strontium metal production is reduction of strontium oxide with aluminium. It occurs in white masses of radiating fibres, although pale green, yellow, or gray colours are also known. Strontianite forms soft, brittle crystals that are commonly associated with barite, celestine, and calcite in low-temperature veins. 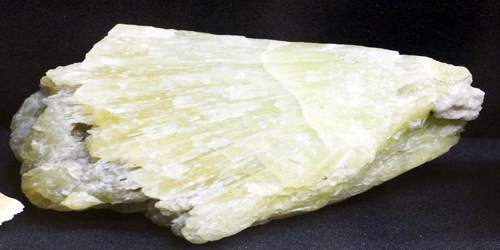 Excellent Strontianite specimens come from Germany in Westphalia at the Dreislar Mine, Winterberg; and the Phoenix quarry, Beckum, where large veins of this mineral contain pockets of fine crystals. Small, prismatic Trillings come from Oberdorf an der Laming, Styria, Austria. A famous locality, from which the name Strontianite is derived, is Strontian, Argyllshire, Scotland. Other European localities are the Ratum quarry, Vosseveld, Netherlands; the Cavradi Gorge, Grischun, Switzerland; and Piagnolo, Campegli, and Casazzascany, Italy. Notable deposits exist in North Rhine–Westphalia, Ger. ; Strontian, Scot. ; and Strontium Hills, Calif., U.S. Strontianite is used in pyrotechnics to impart a red colour and in sugar refining as a clarifying agent. Strontianite is isostructural with aragonite. When the CO3 group is combined with large divalent cations with ionic radii greater than 1.0 Å, the radius ratios generally do not permit stable 6-fold coordination. For small cations the structure is rhombohedral, but for large cations it is orthorhombic. This is the aragonite structure type with space group Pmcn. In this structure the CO3 groups lie perpendicular to the c axis, in two structural planes, with the CO3 triangular groups of one plane pointing in opposite directions to those of the other. These layers are separated by layers of cations. The CO3 group is slightly non-planar; the carbon atom lies 0.007 Å out of the plane of the oxygen atoms. The groups are tilted such that the angle between a plane drawn through the oxygen atoms and a plane parallel to the a-b unit cell plane is 2°40’. Its crystals as dense, fragile, fibrous veins or in massive form, containing microscopic needles or plates. Also in globular balls with small visible crystal spikeheads. May also form as radiating, fibrous, grainy, and columnar. Other habits include bundles of long, curved crystals, and thin, long, sharply pointed needles. Rarely in pseudohexagonal Trillings and singular prismatic or tabular crystals. It is colourless, white, gray, light yellow, green or brown, colourless in transmitted light. It may be longitudinally zoned. It is transparent to translucent, with a vitreous (glassy) lustre, resinous on broken surfaces, and a white streak. Strontianite mineral is brittle, and breaks with a subconchoidal to uneven fracture. 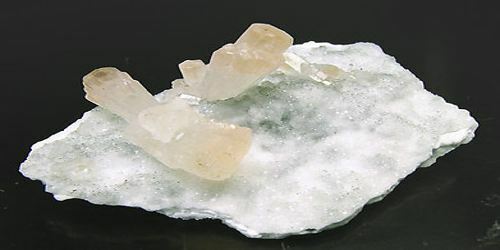 It is quite soft, with a Mohs hardness of 3½, between calcite and fluorite. The specific gravity of the pure end member with no calcium substituting for strontium is 3.78, but most samples contain some calcium, which is lighter than strontium, giving a lower specific gravity, in the range 3.74 to 3.78. Substitutions of the heavier ions barium and/or lead increase the specific gravity, although such substitutions are never very abundant. Strontianite is soluble in dilute hydrochloric acid HCl and it is not radioactive. 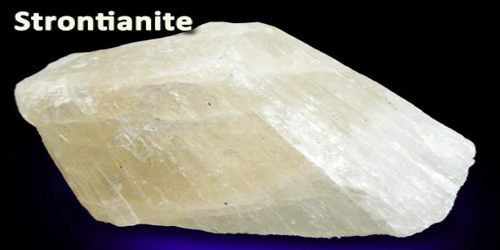 Strontianite is an important ore of strontium, and is used in sugar refining and in the production of fireworks.